The OCS is part of a Federally regulated safety system required for this vehicle. It is designed to turn off the passenger Advanced Front Air Bag for an empty seat and for occupants classified in a category other than an adult. This could be a child, teenager, or even an adult. NOTE: Children 12 years or younger should always ride buckled up in a rear seat in an appropriate child restraint. The OCM is located beneath the front passenger seat. The OCM classifies the occupant into categories based on the measurements made by the seat weight sensors. The OCM communicates with the ORC. The ORC uses the occupant category to determine whether the passenger Advanced Front Air Bag should be turned off. It also determines the rate of air bag inflation during a collision. Your vehicle has fourWeight Sensors located between the seat and the floor pan. The weight sensors measure applied weight and transfers that information to the OCM. The PAD Indicator Light (an amber light located in the center of the instrument panel) tells the driver and front passenger when the passenger Advanced Front Air Bag is turned off. The PAD Indicator light illuminates the words “PASS AIR BAG OFF” to show that the passenger Advanced Front Air Bag will not inflate during a collision requiring air bag deployment. When the right front passenger seat is empty or when very light objects are placed on the seat, the passenger air bag will not inflate even though the PAD indicator light is not illuminated. The PAD indicator light should not be illuminated when an adult passenger is properly seated in the front passenger seat. In this case, the passenger Advanced Front Air Bag is ready to be inflated if a collision requires an air bag deployment. For all other occupants, the PAD indicator light will be illuminated indicating that the passenger Advanced Front Air Bag is turned off and will not inflate. NOTE: Even though this vehicle is equipped with an occupant classification system, children 12 years or younger should always ride buckled up in a rear seat in an appropriate child restraint (refer to “Child Restraints”). Never place a rear facing infant seat in front of an air bag. 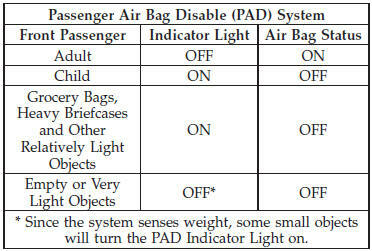 A deploying passenger Advanced Front Air Bag can cause death or serious injury to a child in a rear-facing infant seat. Drivers and adult passengers should verify that the PAD Indicator Light is not illuminated when an adult is riding in the front passenger seat. If an adult occupant’s weight is transferred to another part of the vehicle (like the door or instrument panel), the weight sensors in the seat may not properly classify the occupant. Objects lodged under the seat or between the seat and the center console can prevent the occupant’s weight from being measured properly and may result in the occupant being improperly classified. Ensure that the front passenger seatback does not touch anything placed on the second row of seats because this can also affect occupant classification. Also, if you fold down the seats in the second row check to be sure they don’t touch the front passenger seat. If the front passenger seat is damaged in any way, it should only be serviced by an authorized dealer. If the seat is removed (or even if the seat attachment bolts are loosened or tightened in any way), take the vehicle to an authorized dealer. If there is a fault present in the air bag system, the Air Bag Warning Light (a red light located in the center of the instrument cluster directly in front of the driver) will be turned on. This indicates that you should have an authorized dealer service the system immediately. The Air Bag Warning Light is turned on whenever there is a fault that can affect the operation of the air bag system. If there is a fault present in the PAD Indicator Light, the Air Bag Warning Light will be illuminated to show that the passenger Advanced Front Air Bag may be turned off until the fault is cleared. If the Air Bag Warning Light is illuminated, have an authorized dealer service the air bag system immediately. If an object is lodged under the seat and interferes with operation of the weight sensors, a fault will occur which turns on both the PAD Indicator Light and the Air Bag Warning Light. Once the lodged object is removed, the fault will be automatically cleared after a short period of time.